What Are Three Rules of Personal Hygiene When Preparing Food? What Colors Do I Mix to Get Tan Food Coloring? 1 What Are Three Rules of Personal Hygiene When Preparing Food? 3 What Colors Do I Mix to Get Tan Food Coloring? Purchase supplies. You can find discounted food items at local wholesale clubs like Costco or BJs, or buy in bulk at meat packing districts in your town. Don't forget to purchase plenty of condiments, cooking oil, seasonings, drinks and eating supplies for your customers, including forks, knives, spoons, handy wipes, cups and napkins. Go to your local courthouse or town administration building and apply for a food vending permit. You cannot sell your food out on the street or to the general public without a permit. The only exception is when you are on your own property or at an approved event. If your state has a sales tax, you are required to collect sales tax on your food sales as well, so you will be required to register as a business so the state can collect sales tax from you. This is a very important step---if you're caught selling food without a permit you may face hefty fines and possibly have your food and equipment confiscated. Purchase a vending cart or table. Consider how you will transport your cart when you're making this choice. Buy a food vending cart with wheels and a trailer hookup so you can attach it to your van or truck and haul it away at the end of a selling day. You can also just buy four or more folding tables to set up in a square if you will be vending food at a festival or fair. Design a large colorful poster with your business name, logo, phone number and motto, and hang it on your food cart. Use a large banner sign if you'll be setting up a food table. 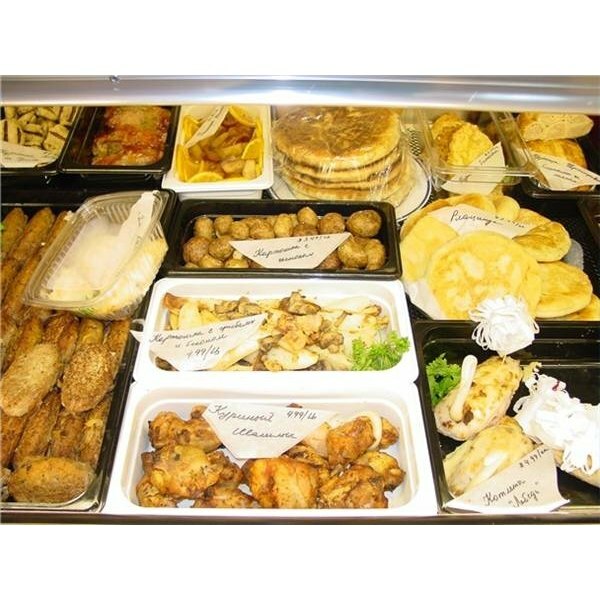 Create an easy to read price list for your customers that shows all the cooked food you have available for sale. Your price list can be your poster---just include the name of your business at the top. Enlist help. Hire one or two more people to help you cook food, handle customers and deal with money. It's almost impossible to take care of all of these duties on your own. Purchase a cash register and/or a safe to store money received while vending your food. Some food vendors choose to keep cash on their person rather than storing it in a register. Sign up for a merchant account if you want to give customers the option of using a credit card; there are cell phone merchant accounts available that will allow you to process a credit card using your cellular phone (see Resources section). Get business cards made to hand out to your customers so they can call you for catering gigs. What Can I Serve With Sweet Chili Sauce?